Short term vacation rentals are hot. HomeAway, one of the first in the space, was facing pressure from AirBnB and wanted a fresh, innovative interface for their hosts. They turned to Springbox to streamline their user interface and regain traction in the market. With HomeAway's desire to overhaul and streamline their experiences, we had some room for creativity. Our initial project centered around the Resource Center, an online learning resource for homeowners to improve the experience for renters and boost their income. Since our team at Springbox was utilizing the Agile methodology, we needed to work quickly. No better way to do that than working on good old fashioned paper. Once I presented some wireframe concepts to the team during a daily standup, I moved to another fast and powerful tool; Axure. One concept for the desktop wireframes was to make a gamified experience. With everything located in an I-Frame with multiple ways to navigate to new content, the experience resembled a learning management system (LMS), making everything easy to step through. Special attention was paid to slice the content into intuitive, chronilogical blocks to make it easy for homeowners to find what they need. Facilitated by the quick nature of Axure, I was able to mockup several versions of the prototype with great speed. Showing variations of the similar concept was a way to show the team at HomeAway that while the structure was different than what they're used to, the visual language could be made to look however they liked. The final, developed website was a bit different than what I proposed in my wireframes, but still had many of the key elements. We used the hero carousel on the homepage to introduce what we identified, through their data, what most users wanted to see. The chunking of content into lifecycle stage, which was the most radical element proposed, was moved to the "Become An Expert" L1 page, rather than the homepage. 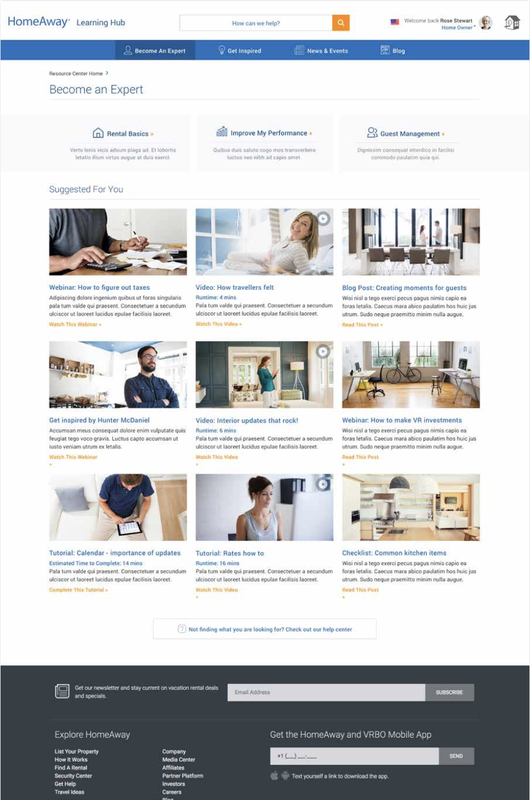 The client wanted a more traditional look on the homepage, so we optimized it and created valuable blocks of content and ran these concepts through usability testing. One of the main goals of this project, other than creating a nice interface for users, was to get homeowners the info they need, fast. We pored through call-driver and traffic data. This data was the impetus for the lifecycle-stage approach to the information architecture. Another concept I utilized was finding those specific call-drivers and surfacing the tutorials, webinars and other posts to address them specifically. The final site was a successful mix of the gamified, innovative concept and a more traditional educational site.